A Tiffany Stone nodule, sliced in half and polished. Can you see why some people call it "ice cream stone"? Public domain image by Scott Horvath, USGS. "Tiffany stone" is a trade name used for a purple, blue and white gem material that can be cut and polished into beautiful beads, cabochons and tumbled stones. Geologically, Tiffany stone is a rock composed primarily of fluorite with smaller amounts of opal, calcite, dolomite, quartz, chalcedony, bertrandite and other materials. Other names used for Tiffany stone are "opalized fluorite," "ice cream stone," and "bertrandite." Utah Tiffany Stone: "Tiffany Stone" is an unusual material found as mineralized nodules in a beryllium tuff at the site of the Brush-Wellman beryllium mine. It is thought to be an opalized fluorite. Tiffany Stone is also known as "bertrandite" and "ice cream opal." It is a rare material found only at the Brush-Wellman location. Where Is Tiffany Stone Found? 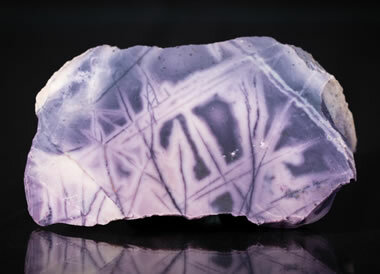 The United States Geological Survey reports that the nodules are carbonate clasts that have been largely replaced by fluorite. Small amounts of bertrandite, a beryllium mineral with a chemical composition of Be4Si2O7(OH)2, occurs as submicroscopic grains within the fluorite. The most appropriate name for Tiffany stone is “opal fluorite” or “opalized fluorite.” These names reasonably represent the composition of most specimens. Another popular name is “bertrandite.” That name is incorrect because bertrandite is a mineral, which only comprises a few percent of the rock known as Tiffany stone. It is also called "ice cream stone" because of its delicious color. Where Can You Buy Tiffany Stone? Although Tiffany Stone can be very attractive, there is an important thing to consider when using in jewelry - it has a Mohs hardness of only 5 to 5 1/2. That makes it very easy to scratch. If Tiffany Stone is used in a ring, it will quickly show signs of wear and lose its nice polish and luster. For that reason, Tiffany Stone is best used in pendants, beads, earrings and other types of jewelry that will not be subjected to abrasion. One thing about Tiffany Stone that will probably make you happy is its price. Even though it is very rare and quite beautiful, cabochons with beautiful color, pattern and size can usually be purchased for $75 or less. It also looks great in white metal. That allows it to be placed in a sterling silver setting, getting you the whole piece for a price of $150 or less.